THE Zambia Police Service has warned of stern action against United Party for National Development (UPND) members if they continue with their newly-adopted political strategy of holding meetings in the bush. 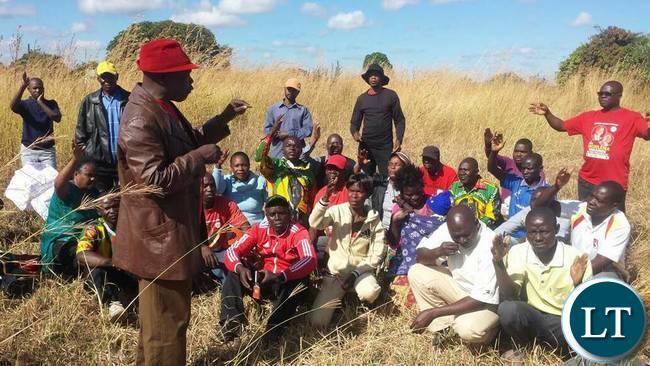 On Thursday, UPND Northern Province chairman Nathan Ilunga said in a statement that the party is now having its meetings in the bush for fear of being arrested by the police. But police spokesperson Esther Katongo said in an interview that people should follow the country’s laws when holding meetings to avoid being in conflict with the law. “Those daring the police by going ahead to hold meetings in the bush may be doing that at their own peril, because we shall not tolerate that,” Ms Katongo said. She urged the UPND members to do the right thing before they regret their actions of taking the law into their own hands. Ms Katongo said what qualifies a meeting to be regulated is what people are discussing. She said provisions of the Public Order Act are clear and that it only exempts religious meetings from regulations. Military science 101 interprets this as a precursor to an insurgency- the State must act fast and swiftly to prevent such subversive meetings from taking place. Why holding meetings in the bush???? War is the last thing anyone wants, even those in prison are better of than a civilian caught up in war! War will turn the rich and middleclass into beggar refugees, the only ones who will enjoy war are the blood thirsty sadists!! War must be prevented at all cost!!!!! All borders must be sealed-smuggling must be monitored and put under control- high risk points-borders with Angola, Congo and Namibia. Just deregister this party. This party is the bad seed for this country. Marengo, this country belongs to all. By the way the bushes are part Zambia. Mumbi every day she holds meetings without permission. What law are you talking about. Ba 2020vision, it’s too late to talk about avoiding war! You are busy encouraging Lungu’s dictatorial tendencies and denying people the freedom of speech and assembly then you expect us to be docile and take it as it comes … Well, I say brace yourself! Where do you want them to hold meetings from, when they meet at party secretariats you follow them, when they gather at public rallies, they clamp them down, when they want to send off their party members at funerals you still attack them, when they are at their own homes, you send in more than a 100 to arrest them, what do you expect from them now, you are the ones forcing them to MUSHALA AND SAIMBWENDE. UPND are still under going cognitive development politically. They are at sensorimotor stage. They think like kids. They need to be monitored of with care just like their under five leader double HH is put in the coat bed and scrupulously being monitored. At at this stage children need special care and learn from adults or grown ups. If left unchecked, they would go on do thing their on way in their try and error SENSORIMOTOR character. Lest the touch fire or drink poisonous liquids. What experienced nationals such as USA and UK are saying is that dont spare these growing up political minors they can distablise peace in Zambia. Yet it seems as if it is PF or the ZP who are being harsh. Leave them to stray, and the whole world will blame ZAMBIA’s security and leadership. Blame that tactless Ilunga for revealing the secret. This former governor cannot be trusted at all. Just hang yourself you are not worthy the useless watcha. PEOPLE MUST BE SERIOUS.HONESTLY, IS ZAMBIA AT WAR?THIS IS MUSHALA TYPE OF THINKING.UPND MUST BE SERIOUS. THE MORE THEY WORST TIME ON TRIVIAL ISSUES,THE MORE THEY LOOSE TIME ON PREPARING FOR 2021 ELECTIONS.THINK LIKE PF WHEN THEY WERE IN OPPOSITION.NO WONDER KABIMBA KEEPS ON LAUGHING AT YOU.ONE TIME HE SAID UPND IS JUST A TRIBAL GROUPING AND NOT A POLITICAL PARTY AND I THINK I CAN I SUPPORT HIM NOW. The UPND rejected the referendum on the bill of rights which could have given them more rights including freedom of association. These are Adamson Mushala tactics. The legendary lives on. Very premitive indeed. They are lucky Zambia does not not have the helicopter gunships to weed these people out of the bush. The only problem Zambians have is to show off, why should these fools not have kept this strategy to themselves and use it to their advantage? Did they really need to expose themselves? Ubub bwena bupuba fye bweka bweka.